Although beer giant AB InBev might have won one battle against its Czech brewery foe Budejovicky Budvar, it’s a whole different story in Italy. An Italian court has banned AB InBev from selling Budweiser beer under that name in the country, granting its favor instead on Budvar’s claim on the name. The two companies have been fighting for over 100 years to gain the one true crown as makers of Budweiser, a name both use but have butted heads about who can use it where. He said the court called AB InBev’s use of the trademark deceptive and struck it from the trademark register. 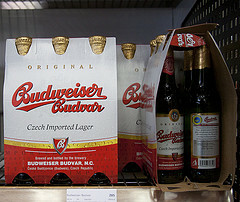 “Therefore our competitor must stop selling Budweiser beer in Italy,” he said, adding that the verdicts are final. AB InBev says it’s disappointed with the ruling but is far from giving up. “We continue our efforts to secure our Budweiser trademark rights in Italy. To do so we are considering our legal options,” a spokeswoman said in a statement.